Falls Church City Hall is located at 300 Park Avenue, Falls Church, VA 22046; phone: 703-248-5001. Photo: Pond-Copeland House, 407 East Columbia Street, Falls Church, VA; ca. 1875-1885 vernacular residence originally owned by Benjamin Pond. 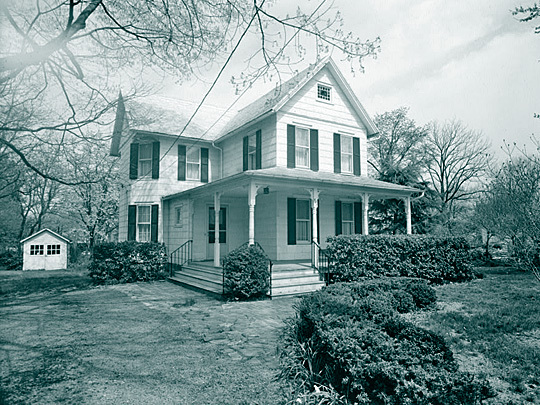 Photo by Jack Roberts, 1967, Historic American Buildings Survey [HABS VA-737], memory.loc.gov, accessed October, 2012. Falls Church is an independent city, situated just six miles from the nation's capital. This proximity has been a major influence on its development, especially over the last century. Although Falls Church is small in area and population, its heritage is long and predates America's colonial era. As far back as 12,000 years ago, the gently rolling landscape of Falls Church was traversed by Native American hunter-gatherers. As they moved inland from the north and east, they traveled on trails that were within the present boundaries of Falls Church. After a series of wars ending in 1677, they left the region and European settlers gradually moved into the area. The first structure believed to have been built in the Falls Church area in colonial times was a log cabin known as Big Chimneys, which was probably constructed by a squatter in 1699. It, with additions, subsequently served as a home, tavern, and way station for travelers and tradesmen. Farmers acquired most of the land surrounding Big Chimneys between 1724 and 1742. Tobacco was the principal crop and a major barter currency at that time. It was used to pay for the frame Anglican Falls Church built in 1733-34 and for a succeeding brick church built in 1767-69. George Washington and George Mason were vestrymen at the church, which together with the county court, constituted the local government. By 1776 the Falls Church settlement included two churches and two taverns, and about a dozen nearby farms. In 1790 Congress decided to locate the capital of the new nation on the Potomac River. The west corner of the District of Columbia, initially ten miles square, was about one mile north of The Falls Church. An agricultural depression early in the 19th century slowed growth, and the village remained sparsely settled until after the Alexandria-Leesburg Turnpike was completed in about 1840. Other growth factors were an influx of northern farmers in the 1840s and 1850s and the arrival of the railroad in 1859. The Falls Church area was occupied by the Union Army for over three years during the Civil War, which significantly slowed the growth of the village. Members of northern troops returned to settle in the Falls Church area after the War. Falls Church's Fort Taylor Park is a landmark of Civil War history and is designated on the Virginia Civil Wars Trails. It represents the location of the first military ascent of Thaddeus Lowe's observation balloon in 1861. The City, along with the Victorian Society at Falls Church, Historical Commission, and other organizations, has actively supported interpretive events at various City locations to promote public interest in Civil War history. When the War ended in 1865, Falls Church village contained about 40 structures. Before long its recovery was underway as new settlers moved in from the north and freed slaves settled south of The Falls Church. The national temperance movement had many supporters in the village, which came to be described as a temperance stronghold. Soon they were seeking town status from the state legislature as a means to improve the community. Falls Church was incorporated as a town in 1875 and established a public school the same year. Falls Church grew quickly after its incorporation. Its growth paralleled that of the federal government as many government workers settled here. In 1878 there were over one hundred residences, eleven commercial structures, and eight churches. By 1904 there were one hundred twenty-four residences, fifty-four commercial structures, three post offices, two schools, trolley and train stations at each end of town, two lunch rooms, a hotel, and a meeting hall. The population increased from 792 persons in 1890 to 1,128 persons in 1910, by which time Falls Church was the largest town in Fairfax County. Electric trolley service to the District of Columbia began in 1897, and offered an increasing number of public services and civic organizations to its residents. During the Spanish-American War (1898) when the army set up Camp Alger nearby, Falls Church was briefly a boomtown. In 1915 the Town Council adopted a residential segregation ordinance, but never implemented it after citizens of African-American descent mounted an effective opposition and formed the first rural chapter of the N.A.A.C.P. in the country. The growth of the government during World Wars I and II resulted in additional growth in Falls Church with the population increasing from 1,659 persons in 1920 to over 5,000 persons in 1948. By 1939 the electric trolley had ceased operations and automobiles were the principal means of transportation. During and after World War II, a huge influx of government employees spurred home construction and improvements to the education, transportation, and water supply systems. Falls Church was still the most developed area in Fairfax County and its citizens wanted more control, especially of their schools. Their desire for an improved school system sparked the effort to achieve independent city status. In 1948 the population of Falls Church exceeded 5,000 persons, enabling it to become an independent city. One year later the City's school system became independent as well. The City established three schools between 1952 and 1955, and voluntarily integrated all of its schools in 1961. The Falls Church schools have consistently won wide recognition for their high quality. Falls Church takes pride in being a modern city that maintains its small-community atmosphere and preserves its historical heritage. Though many historic buildings, particularly in the commercial corridors, are now gone, their locations are remembered and their roles in the development of the community are acknowledged. City of Falls Church, Virginia, Comprehensive Plane, 2005, www.fallschurchva.gov, accessed October, 2012.